Growing numbers of drug resistant disease causing bacteria are being recorded by Asian scientists. The widespread use of antibiotics, particularly substandard “knock-off” products in the developing world, combined with natural selection, has created a global threat called “apocalyptic” by chief medical officer for England, Prof Dame Sally Davies. The MRSA outbreaks of 2005 carried a dire warning and created fear on hospital words but with other common bacteria finding resistance to antibiotics has that warning been heeded. The prevalence of these antibiotic resistant strains of gonorrhoea, malaria, tuberculosis and cholera are common in the region according to Indian scientists. New Delhi metallo-beta-lactamase, the enzyme which gives resistance to many of the antibiotics used against drug resistant strains of bacteria, is becoming more widespread. The enzyme is being discovered in new bacteria regularly and microbes such as e-coli and the bacterium which causes pneumonia are the most recent examples. In April 2011, on World Health Day, The World Health Organisation warned that the world’s honeymoon period with antibiotics, since their introduction in the 1940’s, was over and that action was needed. Papers released in the same year detailed concerns of the prevalence of drug resistant strains of many disease causing bacteria across Asia. Despite these warnings, antibiotic resistant bacteria in Asia are on the rise and at alarming rates. This is due to the wide availability of cheap, over-the-counter drugs which are often sub-standard, the lack of control measures by governments and lack of understanding of the consequences. The reason widely-available, low-quality antibiotics are creating the issues we see today is natural selection. While evolution in animals, plants and other multi-cellular organisms is a slow process taking thousands even millions of years, in bacteria it is vastly quicker. Because bacteria multiply so rapidly and on such large scales, the opportunity for developing resistance is higher. If low quality antibiotics are used and not all the bacteria are killed, the remaining bacteria will be the most resistant to the treatment. These bacteria then rapidly multiply and if repeated highly resistant strains develop. The overuse of antibiotics, will inevitably lead to resistance also through the same theory. Additionally, bacteria have more fluid DNA structures than multi cellular organisms and can “share” resistance genes with other bacteria through use of plasmids. The result of this is that once revolutionary drugs will become defunct, leaving bacterial infection untreatable through this method. The WHO among other experts have claimed that we are charging towards a “post-antibiotic era” because drug companies have run dry in their model for producing new antibiotics. If we look at the case of MRSA, we can see an alarming precedent. In 1959 methicillin was introduced to the UK as a treatment for penicillin resistant Staphylococcus aureus. 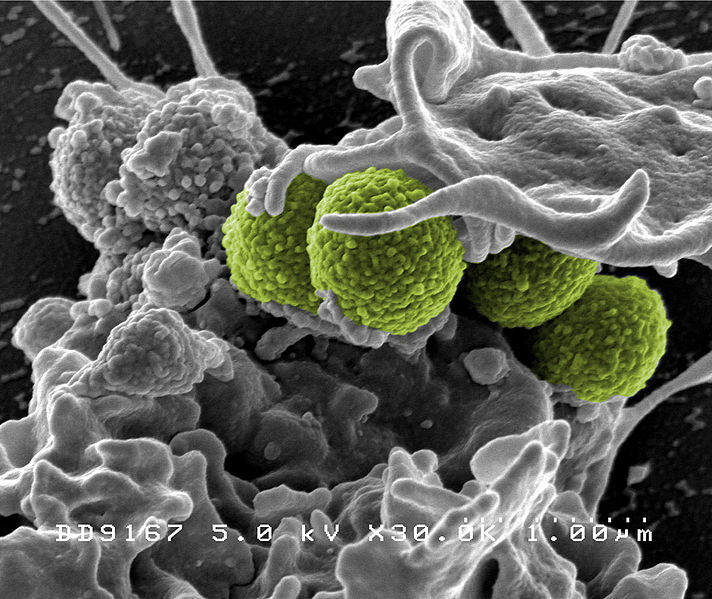 Less than ten years later outbreaks of MRSA began. From there, many Western European countries have between 25 and 50 per cent of their populations who carry MRSA in their blood.